For the 6th consecutive year I have taken it upon myself to compare BFM pricing with our local grocers. 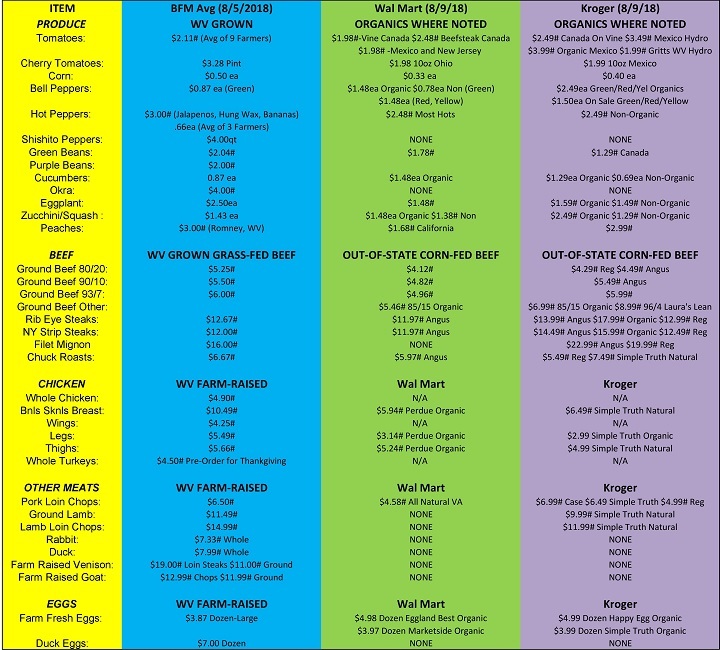 Again, I picked a Sunday during the peak season and gathered pricing info from all of our meat and produce vendors to arrive at an average price. Remember the word "average", so some vendors are higher and some are lower than these prices. Like American capitalism itself, it's a free market and the farmers set their own prices. This year there is not much more for me to say about this that I haven't already stated over the past 5 years. See the links at the bottom to look at those past surveys. Other than colorizing the chart (thanks, Ted Turner) not much has changed since last season. And this is the reason that I state in the title that this is the final survey that I will be doing. The point has been proven and it's time to move on. You see, the reason I started this exercise in the first place was to prove a point to a good friend of mine. That point being that a farmers market was not a cost-prohibitive place to shop. This friend told me that "prices at farmers markets are as much as ten times as much as the grocery store." I begged to differ. The friend challenged me and, not one to back away easily, I took the bait. So, what have I learned these past five years? Well, for one it validated my commitment to shop local whenever possible. And it's certainly made me think about the idea of "price" being the only thing shoppers think about when feeding their families and how the term "low price" has so corroded the American marketplace. What I've come to believe is that, in our constant quest for the lowest price possible, we've given short shrift to quality and no thought to how that low price affects others both here and abroad. Here's just one example that recently happened here in West Virginia. Obviously, I'm not speaking out of turn when I say the 500 pound gorilla when it comes to "low, everyday" prices is Walmart. But what are the hidden costs to a small community when a Walmart comes to town? And what happens to a small community like, say, McDowell County in southern West Virginia when a Walmart both makes a triumphant entrance into the community and then, just as suddenly, closes? What generally happens when a Walmart opens in a small, depressed community like McDowell is that all the community-minded local retailers who have struggled to survive for years either find a niche to fulfill that Walmart hasn't filled yet or they fight the price battle with Walmart until they're forced into bankruptcy. This is what happened in McDowell. Since fresh food is one niche that Walmart fulfills in spades most, if not all, of the area's small grocers closed. So, when Walmart decided even they weren't turning enough of a profit in McDowell they shut their doors as well and turned the county into what's known as a "food desert". Twenty thousand citizens with nowhere to buy fresh food within a 40 miles drive. Now, before you think I'm trashing Walmart that's not my point nor is it my intention. Walmart is going to do what they think is best for themselves and their shareholders and that always falls back on profit. That's what a corporation does. We live in a capitalist system and I am happy that I do. I am a small business owner and take full advantage of that system to improve my own family's situation. What I'm saying is that it is up to "We, the people" to decide what we think is best for ourselves and our families. For me that means a personal choice to shop for as many things as I can locally. Even if it may be a bit higher in price. And shopping at a farmers market is a double dose of shopping locally. The vendors at a farmers market are not just retailers but also producers. They don't just buy goods from somewhere else and resell them, they actually create the goods they sell whether by planting something in the soil or raising an animal. It doesn't get any more local than that. Anyway, here's the price survey for 2018. I will once again point out the diversity of the products you will find at the BFM as evidenced by all the "NONEs" in the Walmart and Kroger columns. And this only scratches the surface of the selection. I encourage you to stop and chat with a farmer you may have never spoken to before and ask them about their product mix. Don't be surprised to find out that there are many different types of kale or that there's a type of spinach called Malabar. Did you know you can buy farm-raised rabbit, venison, and goat meat at the Market? These are all very healthy protein alternatives to red meat. But, if you're just not an adventurous eater you can also find most of the standards of the American diet at the BFM as well. And as you can see below you won't have to pay even twice as much, let alone ten times as much, for them. And the food will be fresher than anything you will find at the grocery store. I'll close with this thought. You won't find everything you need at the BFM and we understand that. But our argument is this; shop the Market FIRST and then go to the supermarket. You may be surprised at how much space is left in your buggy at the end of the second trip. Click HERE for a printable copy of the 2018 survey.